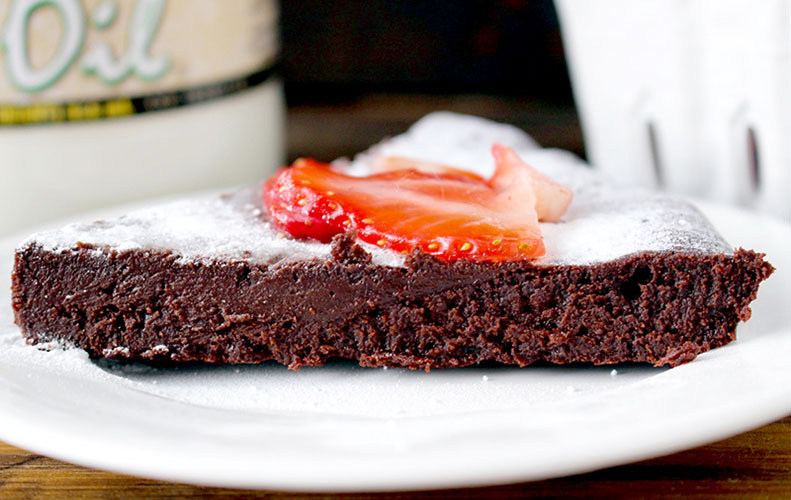 7 simple ingredients and 30 minutes and you have one rich, decadent cake. 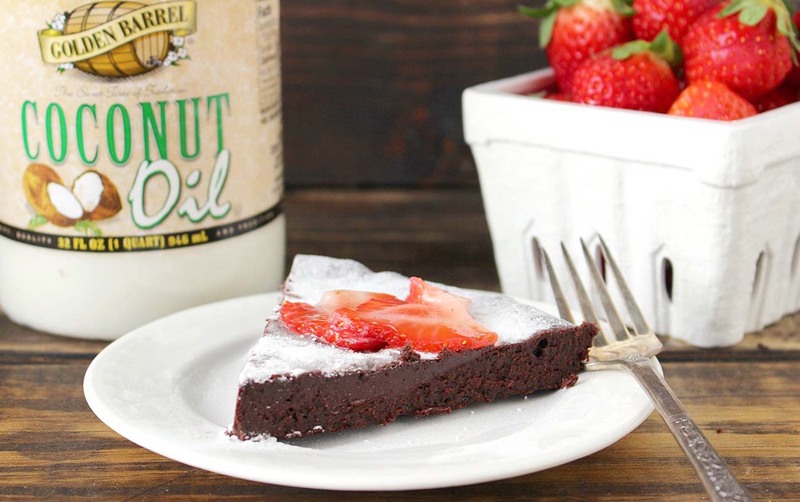 Gluten free, dairy free, and refined sugar free. So easy and delicious! 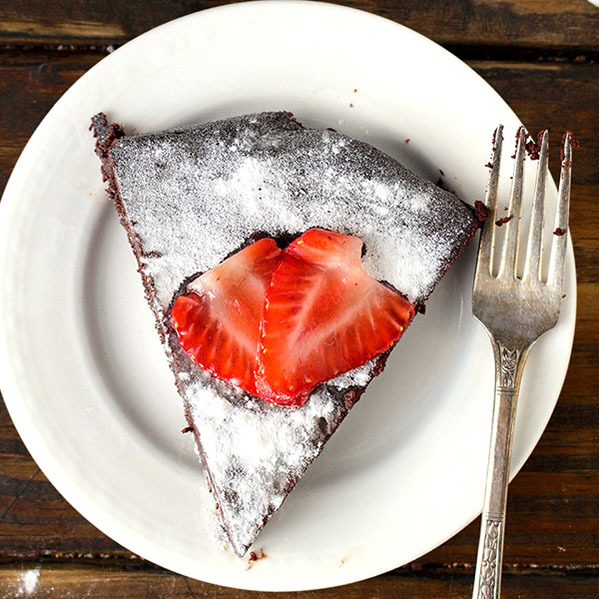 Flourless chocolate cake is a pretty common dessert that most people have either had or heard of. I’ve never actually made the traditional version, but looking up recipes, most called for a ton of sugar and butter. 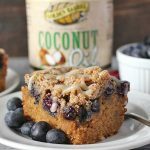 Making it over wasn’t too hard- switching out the butter for Golden Barrel Coconut Oil and replacing the sugar with honey turns it into a much healthier cake. It is still a treat, but one with ingredients that are better. 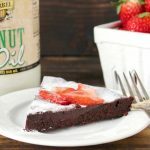 All the variations of flourless chocolate cake are naturally gluten free, but this one is also dairy free and refined sugar free. This cake is made in one bowl, only takes a few minutes, and I’m certain you will love it! It is very fudgy and rich so a small piece is all you need. 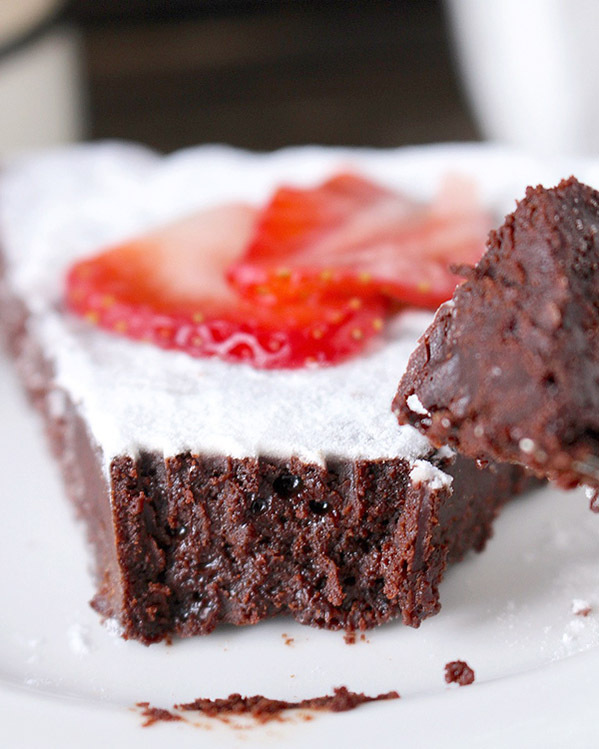 This is not a light, fluffy cake- it is dense, moist, and very chocolatey! I recommend serving it with strawberries or some other fresh fruit- it offsets the richness a little and adds such great freshness. One tip I have is to mix all the ingredients with a whisk. It helps when melting the chocolate and coconut oil together to make sure it’s completely smooth. And it helps when mixing in the cocoa powder to make sure there are no lumps. Preheat oven to 350° and line a round cake pan with parchment paper. 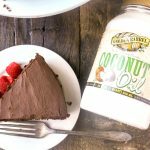 In a large bowl, combine chocolate and Golden Barrel Coconut Oil. Microwave until completely melted, about 1 minute and 15 seconds, stirring every 30 seconds. Whisk in the honey, then add the eggs one at a time. Add the cocoa powder, espresso powder, and salt. Whisk until fully combined and no lumps remain. Serve with fruit if desired. So, what is sprinkled on top? 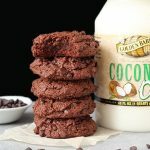 Do you think this could work without the chocolate, just using more cocoa powder? 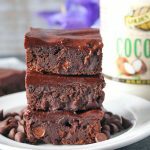 Hi Chris- I don’t think just replacing the chocolate with cocoa will work because that will change the wet to dry ratio. You could try it and add more liquid, but I can’t say for sure it will turn out the same. I hope that answers your question- let me know if you try it. Hi Jamie- a 9 inch round pan. Hope you enjoy! Could I replace the honey with stevia? Hi Vicki- that may work, but you’ll need to increase the et ingredients a little to make up for the loss from the honey. Maybe a little more coconut oil? Let me know if you try it. Awesome! I’m so glad you like it, Darlene! Hi, Jessica. Does not take baking powder? Thanks. Hi Marina- no baking powder. That would cause it to rise and it is meant to be dense and fudgy. I hope you enjoy! Hi Brenda- yes, that should work just fine. Enjoy! Weird question about whether this would freeze ok, or keep a couple of days in the fridge? My boyfriends birthday is coming up, but we will be away for a couple of days before and coming back that night – I’d like that have a cake for him if possible. Hi Sarah- it will stay good in the fridge. Hope you love it! Hi Jessica! I just made the flourless cake ! EVERYONE devoured it!! Of the 4 of us – I am the most Paleo so I have made many desserts that NO ONE liked. Your cake tastes and looks so good! 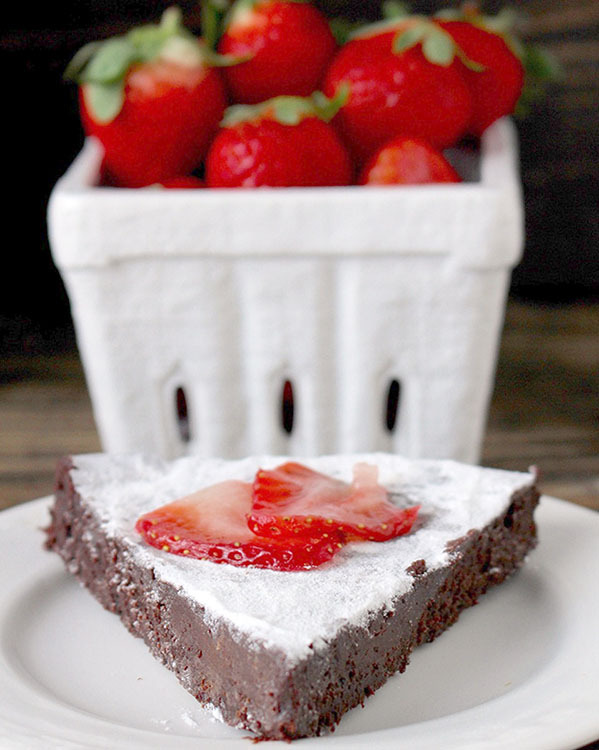 Topped with powdered sugar and fresh strawberries. There were no leftovers and my family wants me to make this again. Thank you so much!! You’re welcome, Jan! Thanks for trying my recipe! I’m so glad everyone enjoyed it 🙂 Thanks for the great feedback! Hi Ruth- cups don’t usually vary in size. 1/2 cup is 8 tablespoons and 3/4 cup is 12 tablespoons. Hope that helps! Hiya, what if I don’t have any cocoa powder. Could I replace it with more chocolate? Hi Niki- unfortunately that won’t work because that cocoa is needed to balance out the wet ingredients. I suggest buying more and trying it as written. Hope you love it! It is in the oven for 25 minutes already and it is jiggly. Is that how it comes out? Thanks. Hi Jenny- this is too late, but it shouldn’t be jiggly in the middle. Maybe add 5 more minutes. I mean, I’m sure it will taste delicious, just be a little messy. Hope it came out okay.